How to secure networks when quantum computers can crack current encryption is a key theme for July, ranking alongside alongside the ability to put effective neural networks in embedded chips. These have pushed IoT stories slightly further down the list, although the latest narrowband cellular trials in Brazil and using 802.11ac WiFi networks have also captured the interest of embedded designers. AI on a stick from the Movidius division of Intel also allows designers to test out the technology before embedding the chip into designs. 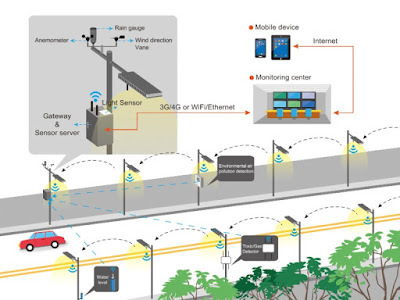 Echelon is known for its LON networking protocol, but the Internet of Things pioneer has also completed initial field tests of another new application using connected camera modules on streetlights to count traffic. The InSight Cognitive Vision System communicates over the existing lighting network using the underlying LON protocol and so can be deployed on any streetlight, not just those in intersections adjacent to traffic control boxes. This allows more cameras to be used cost effectively. InSight accesses the Lumewave lighting control network, allowing placement of the self-learning system on any streetlight instead. Moving the traffic counter from the roadway surface to a streetlight simplifies deployment, and moves the sensor into a more versatile location. And by using the existing connected lighting platform, the traffic counting application offers smart cities a lower cost alternative in managing energy use as well as a platform to broadly collect traffic data. “We are encouraged by these field test results that demonstrate that InSight provides reliable traffic flow information directly into the street lighting process,” said Adam Miles, Associate Traffic Engineer, City of Spokane. “Over time, we believe the aggregated traffic data we collect will enable us to address resident and commuter needs in new ways we are just beginning to consider." "With the deployment of this new application, cities and campuses can begin to see how InSight will provide the foundation for a family of AI-based tools leveraging the omnipresence of street lights connected with Echelon technologies," said Ron Sege, Chairman and CEO of Echelon. "Street lights are everywhere - these tools will take them from being simple re-implementations of 19th century gaslights, to the basis for providing advanced 21st century capabilities enhancing safety and quality of life for individuals and businesses, at a lower cost than today's simple lights alone." Silicon Labs has launched a new family of its Giant Gecko controllers with 2Mbytes of flash and a 72MHz ARM M4 processor core for complex nodes in the Internet of Things (IoT). The EFM32GG11 Giant Gecko family is targeting smart metering, asset tracking, industrial/building automation, wearables and personal medical applications with a starting price of $5.66 in volume. The chip includes hardware support for AES encryption as well as fine grained security to control access to the peripherals such as LCD and capacitative touch sensors and a NIST-certified true random number generator (TRNG) for higher security randomization. 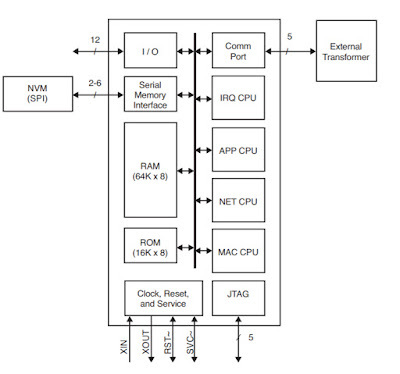 The Giant Gecko family has SD/MMC and Octal/Quad-SPI memory interfaces to support additional memory expansion capabilities for memory-intensive applications as well as fast wake-up/sleep transitions and a low-energy fabric allowing autonomous access to sensor inputs and enabling low-power peripherals to operate autonomously. The key power consumption is 77 μA/MHz in active mode and 1.6 μA in deep sleep mode. Giant Gecko MCUs will be available in QFN, QFP and BGA package options with up to 192 pins, including many packages that are footprint-compatible with existing EFM32 MCUs, in early 2018. Software compatibility across the EFM32 MCU and EFR32 Wireless Gecko SoC portfolio enables broad software reuse and reduced design time and cost for developers. Silicon Labs’ Simplicity Studio development tools support the Gecko MCUs, giving developers one-click access to everything needed to complete projects in a unified Eclipse-based environment. Simplicity Studio includes graphical configuration, advanced energy monitoring, network analysis and capacitive touch configuration tools, as well as software examples and documentation. Giant Gecko MCUs natively support Micrium OS, and developers have easy access to Micrium tools through Simplicity Studio. Engineering samples of the EFM32GG11 Giant Gecko MCUs are available today, and production quantities are planned for Q1 2018. Pricing for EFM32GG11 MCUs in 10,000-unit quantities begins at $5.66. The SLSTK3701A Giant Gecko Starter Kit is available now and priced at $99.99. Online design platform and marketplace for community-developed intellectual property (IP) efabless has launched an open source framework for community members to create, share and commercialise mixed-signal ICs. 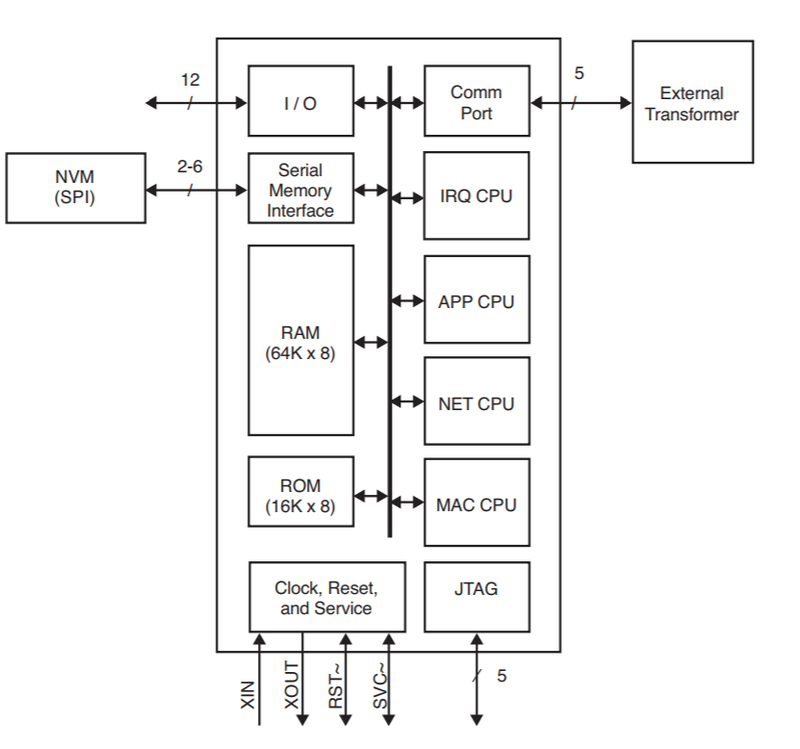 These chips combining analogue and digital elements are a key capability for designs in the Internet of Things. Chiplicity is essentially a development kit for integrated circuits, similar to hardware or software design kits. It includes all the tools needed for a full design cycle to design, verify, validate and prototype mixed-signal products, from idea to completed manufacturable GDSII files. It also offers a set of related library components — an open source chip called Hydra, analogue IP, a standardised pad frame and a serial interface (SPI). A soft variant of the PicoRV32 RISC-V CPU core, developed by open source active contributor Clifford Wolf, is part of the efabless digital library located in the beta version of CloudV. Community members clone marketplace components into their personal workspace on the efabless MyLib repository and create new designs. Final designs can be promoted to the marketplace for sharing with others and community members can manufacture their designs as prototypes through efabless on shuttles at X-FAB. To date, the Chiplicity platform has been used internally to tapeout two ICs. Over time, community members will be able to create and verify increasingly complex mixed-signal ASICs. Chiplicity will offer a flexible pad frame generator and additional analogue and digital IP, including a variety of microprocessor cores, additional open source IP and community-developed analogue IP blocks. efabless also will offer open source test boards as library components to validate custom analogue circuit designs. Community members will be able to share designs under proprietary or open source licenses. efabless currently supports X-FAB’s XH035, 350 nm mixed-signal process. Its technology roadmap includes support for additional foundry processes, such as 180nm and 130nm nodes. 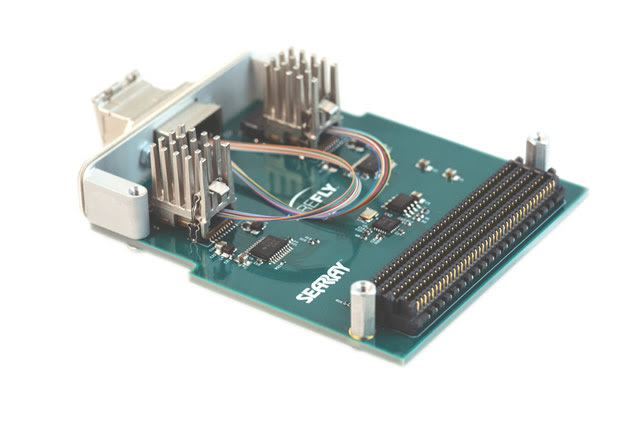 Samtec has launched a series of 14 Gbit/s Development Kits to simplify the connection between FPGAs and fibre optic links. The kits provide an easy-to-use evaluation and development platform for Samtec’s FireFly optical engines. The 14 Gbit/s FireFly FMC Module provides up to 140 Gbit/s full-duplex bandwidth over 10 channels from an FPGA to an industry-standard multi-mode fibre optic cable for data centre and high performance computing (HPC) designs using protocols such as Ethernet, InfiniBand, Fibre Channel and Aurora. The optical engines are based on proven 850 nm VCSEL array technology while featuring adjustable power levels to support cable lengths up to 100 m.
As a VITA 57.1-compliant FMC, the module can be used for optical data communication on any FMC-enabled FPGA development board supporting high-speed multi-gigabit transceivers. It can run system data or BERT testing from a single channel to all ten channels in parallel. Technical documentation and FPGA reference designs are available for quick start-up. Huawei has launched its first module based on Sequans’ Monarch chipset. The ME309-562 is designed to support M2M and IoT applications in the North American market using the LTE-M/NB-IoT standards. This is the first module to come to market following an agreement between the two companies in February. The LTE Cat M1 module supports LTE bands 2, 4, 12, and 13 and numerous interfaces, including LGA (120 pin), UART, SIM, LED JTAG, power supply and antenna. It includes an embedded UDP/TCP/FTP/HTTP stack and proprietary FOTA. The module is based on Sequans’ Monarch chipset that is specifically designed for narrowband IoT applications, including sensors, wearables, and other low data, low power M2M and IoT devices. One of the original low cost networking chip developers, Echelon, has run its LON protocol over a wireless mesh network for the first time. Echelon was one of the pioneers of the Internet of Things, and has launched a multi-protocol system on a chip called the Neuron 6050. This is being used by a design house in Germany called who to create a new transceiver that uses LON over the Wirepas Connectivity RF-mesh wireless technology for the first time. The Neuron 6050 IP Processor (below) incorporates communication and control functions on a single chip, in both hardware and firmware, to handle LonTalk, LonTalk/IP or BACnet/IP devices. This allows system integrators to build large scale, interoperable wireless systems based on protocols that have been tested over millions of endpoints worldwide. In a first application, the Vossloh-Schwabe division of Panasonic will incorporate the new device into a large scale outdoor lighting controls (OLC) system. Vossloh-Schwabe (VS) has designed the system using Wirepas for large scale wireless Internet of Things (IoT) applications, including smart city street lighting with thousands of nodes. VS and who are currently testing the new solution using Wirepas and expect to complete a project in a large city in Germany early next year that will empower approximately 1000 streetlights with the new technology over a 10 km area. The companies have begun the process of submitting this new LON-over-Wirepas specification to the European Committee for Standardization (CEN) and to LonMark International for standardization, with adoption of the new LonMark channel expected early next year. "The Wirepas and LonWorks protocols are organized in similar fashion so creating the interface between them was simplified," said who mbH managing partner, Henning Woock. "And using the Echelon Neuron 6050 chip was the most natural choice to ensure full multi-vendor interoperability. We are excited to be the first to bring to market new transceivers that incorporate all of these excellent technologies. There is pent-up demand in big cities and campuses that have been waiting for a solution that can efficiently address large and complex networks of devices from multiple suppliers." Wirepas has been widely deployed in various large scale applications including smart electricity and water meters, asset tracking applications and street lighting. The largest deployment, which is ongoing, comprises 1.6 million smart electricity meters in Norway. "This advancement in controls communication demonstrates the ongoing benefit of LON standardisation and leverages our investment in the new Neuron 6050 system on a chip," said Ron Sege, Chairman and CEO of Echelon. "This is a groundbreaking development. For the first time LON protocol can be used to communicate wirelessly over large scale networks spanning thousands of nodes over vast distances." "We are delighted to see these exciting new products that will be joining the LonMark family of fully interoperable solutions," said Henny Wieland, Europe Manager, LonMark International. "Working with our members, we anticipate bringing the new LonMark RF, Powerline, and IP channels to the various international standards bodies as extensions to the ISO/IEC 14908 suite of LON standards." Over the last 25 years Echelon has had over 110 million devices installed worldwide, focusing on smart cities and smart enterprises through connected outdoor lighting systems, and enabling device makers to bring connected products to market faster via a range of IoT-optimized embedded systems. In a big step forward for security applications, SK Telcom in South Korea is commercialising its Quantum random Number Generator (QRNG) technology in a cost effective chip for the Internet of Things and driverless cars. Random numbers are a vital element in current encryption algorithms, and are often generated in software by a pseudo random number generator (PRNG) or using features in a chip with physically unclonable functions (PUF). The chip developed by SK Telecom uses micro machined MEMS structures to trap ions that use quantum interactions to produce true random numbers through an entropy source and Deterministic Random Bit Generator (DRBG). SK Telecom has invested about $2.13 m (2.5 billion KRW) into IDQ (ID Quantique) in Switzeraland which holds major patents for QRNG and has acquired exclusive rights to use IDQ’s patents. The 5 x 5mm chip will be used to provide more security for IoT systems such as autonomous vehicles, drones and smart devices. Although the price of each QRNG chip has not been set yet, the company said that it will be the lowest price ever for a QRNG. SK Telecom is also developing a QRNG in the form of USB and PCIe using the chip. This will make it easier to add genuine random numbers to existing system designs. IDQ, which was established in 2001, was also the first company to commercialise quantum information communication and the two companies have also agreed to co-develop ‘QKD (Quantum Key Distribution’ technology. Toshiba has added the new mesh protocol capability to its Bluetooth Low Energy 4.2 chips and designed a separate front end to give more range for nodes in the Internet of Things (IoT). Toshiba says the combination of the new mesh protocol and its existing software for BLE 4.2 (rather than Bluetooth ) gives a link budget over 100 dB with a new design of external PA and LNA, This provides a range of over 300m open-air range at low-power transmit and receive power levels. The current second generation devices such as the TC35678FSG-002 have a current consumption of 3.3 mA in Tx mode and 3.3 mA in Rx mode. "As a Bluetooth SIG founder and current board member, Toshiba is excited to be among the first to support the organization's push to increase the effective range and robustness of Bluetooth through the introduction of a highly reliable mesh network," said Deepak Prakash, senior director at Toshiba America Electronic Components, "This standards-based approach means that new untapped markets, such as industrial and commercial, can now use ever-present Bluetooth cell phones or tablets to easily control and monitor their systems."